Who doesn’t love a walkie-talkie? Most of us grew up seeing them in actions and adventure movies and shows! There’s something so fun about walkie-talkies–even the name itself evokes play. So, do we really need a reason not to love them? With the Walkie-Talkie app for Apple Watch, Apple brings that youthful spirit to our modern audience. Now we can turn our Apple Watches into a two-way radio AND still use “over and out, “do you copy,” “roger that,” and all that other cool walkie-talkie lingo! Walkie-Talkie is perhaps the most exciting feature on the watchOS5 apart from the ability to play podcasts and the introduction of innovative health features. In this short article, we will show you how you can set up and use the walkie-talkie mode on your Apple Watch. 1 We’ve Waited a Long Time for Walkie-Talkie! 4.1 Can’t or Don’t Want to Press The Talk Button Continuously? 6 Walkie-Talkie and Airplane Mode–does it work? 7 Can I Replay a Message in Walkie-Talkie? 8 Does Walkie-Talkie Work Between Contacts That Share an Apple ID? We’ve Waited a Long Time for Walkie-Talkie! This mode of communicating was first shown off on the Apple Watch when the first iteration was unveiled. However, three years later, Apple still didn’t mention it – until June 2018!. There is now a Walkie-Talkie mode on your Apple Watch, allowing you to send short voice messages back and forth to friends and family, even strangers! And just like a real walkie-talkie, all you need to do is press a button to talk and release it to listen to a reply. The process of doing this is extremely simple, including setting things up. First, set up the FaceTime app on your iPhone and tested it out to ensure you can make and receive FaceTime audio calls. After the Walkie-Talkie app is opened for the first time, you will see some suggested contacts. This list consists of those with compatible Apple Watch’s, making it easy for you to get started. If you want to add new contacts to the list, you can do so by scrolling all the way to the bottom. From there, you will see a “+” icon and can add contacts at your discretion. If you run into issues setting up Walkie-Talkie or you constantly are seeing the ‘Connection error’ or unable to add in the contacts into your walkie-talkie setup, Please take a look at our detailed troubleshooting Guide. Now that your contacts list is ready to go, you are going to want to send a few messages. You can do so by either opening the Walkie-Talkie app, or by setting up a specific complication. After you open the app, tap the yellow “card” for the contact of your choice. At the top, you will be able to tell whether that contact is “available,” making life just a bit easier. The person on the receiving end of the message will have to give permission to the app. This acceptance is one-time, allowing the conversation to proceed as planned. After the recipient grants permission, the corresponding Apple Watch’s is now trusted. Doing so means that you will be able to send or receive messages without any hiccups. Walkie-Talkie is all ready to use! You selected your contact is selected, so what’s next? Just tap the big, yellow button named TALK. Walkie-Talkie records your message for as long as you hold down the button, and then let go to play the message. If you need to step away from a conversation for a moment, Apple has you covered. There is a mute button in the top right-hand corner which will allow you to turn off the audio. Can’t or Don’t Want to Press The Talk Button Continuously? 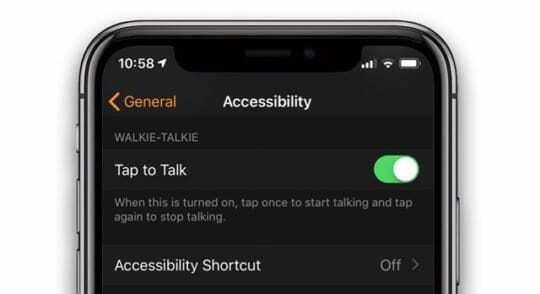 For folks who have difficulty pressing and holding the Talk button, Apple added a method that uses just a single tap, without a hold, to talk with the Walkie-Talkie app. Another thing you may notice is a small yellow icon on the top-middle of your watch’s screen. This is Walkie-Talkie’s active icon. To start a Walkie-Talkie session, just tap that small icon and start talking with friends or family. If you lock your Apple Watch with a passcode, enter it first to proceed. The active status icon is a new feature in watchOS5 for certain apps, like Phone, Workout, Audio, Maps, and Walkie-Talkie. Similar status icons show up when your Apple Watch is charging, using Airplane Mode, Do Not Disturb, Theatre Mode, when your watch can’t connect to your iPhone or Cellular, Water Lock, pending Notifications, and when your Apple Watch is locked. Walkie-Talkie and Airplane Mode–does it work? The good news is that your walkie-talkie app does indeed work when in Airplane Mode–as long as you have a WiFi connection. Since Walkie-Talkie uses FaceTime Audio, anytime you can use FaceTime Audio, you can use Walkie-Talkie! It’s as simple and wonderful as that! Can I Replay a Message in Walkie-Talkie? Unfortunately, in the current version of Walkie-Talkie, you cannot replay any messages. That’s because Walkie-Talkie is for short and brief conversations, relaying instantaneous messages and information. Just like a regular Walkie-Talkie–it’s a quick way to get a hold of someone with some important information. Does Walkie-Talkie Work Between Contacts That Share an Apple ID? We know many families share an Apple ID. However, Walkie-Talkie will not work when members of a family share and use the same Apple ID on their Apple Watches. When you try and use Walkie-Talkie when sharing an Apple ID, you can invite others who share that Apple ID as contacts. However, those invitations are not visible to anyone with the same Apple ID. So they cannot see or accept the invitation on their Apple watches. If you and your family members want to use the Walkie-Talkie app, you need to set up a different Apple ID for each family member. We suggest you all join a Family Sharing Account. Family Sharing supports up to six family members to share iTunes, Apple Books, and App Store purchases, an Apple Music Family Subscription, and an iCloud storage plan. A family can also share a photo album(s), calendar, and reminders, and help locate each others’ missing devices. Apple has really thought of just about everything with the release of watchOS 5. If you have played around with Walkie-Talkie just yet, sound off in the comments and let us know. If you run into any issues, be sure to let us know and we’ll help to the best of our abilities. My daughter and I share an Apple ID. But I created a new Apple ID just for FaceTime and Walkie Talkie. We still both that same Apple ID for most everything on our iPads and iPhones. But I use the new Apple ID for FaceTime and Walkie Talkie–and it works! Will walkie-talkie wirk in Airplane mode? 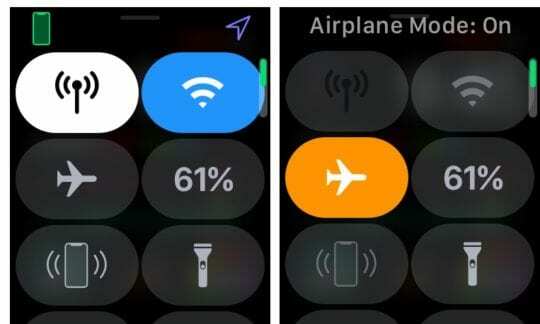 Yes, Apple’s Walkie-Talkie feature should work on your Apple Watch while using WiFi only when in Airplane Mode. The Rule of Thumb: If you can use FaceTime Audio, you can use Walkie-Talkie! Can I use Walkie Talkie with my new Apple Watch Series 4 to communicate with others on a cruise ship? If so, will I incur a charge from my cellular service provider or the cruise line? Is Walkie Talkie like a voice text? I don’t think it could use blue tooth because of the distances involved. I would appreciate any help. Thanks for the question on using Walkie-Talkie on a cruise ship. So, technically you can use Walkie-Talkie; however, you must pay for the internet connection and for most cruises, that’s very expensive. So we do not recommend it. However, most cruise ships offer some type of on-board (often free or one small activation fee per device) messaging services that use your existing device. These messaging services use the ship’s onboard WiFi, usually without a passenger having to purchase an internet package. We don’t know of any cruise lines that offer an Apple Watch App–but it’s a great idea! If your family is going on a cruise, contact the Cruise Line and ask them what messaging services are available on their ship. And don’t forget to leave feedback that you’d love to see an Apple Watch messaging app in the future! My friend and I are trying to add each other. However both of our watches say that we have been invited but neither of us received an invitation. In the phone on the watch app we can see that we are contacts but our screens are greyed out where as though we can talk to each other. Try deleting each other as contacts from the Walkie-Talkie app on your watch (Watch App > Walkie-Talkie > Contacts. Then restart all your phones and watches and try adding the contact back in and sending an invite. How do I replay a message on the app? At this time you cannot re-play a walkie-talkie message. As far as we know, the data is transmitted but not saved. What is the yellow dot for walkie-talkie for? It appears for only a fraction of a second at the top of the watch face. I read that it was a way to tap and the app would open to the “talk” button. But that is not working at all. Again, why is it there? So far, I have not seen a discussion about this anywhere. Ahh, the yellow dot is there to remind you that your walkie-talkie mode is ON. When that mode is ON, your watch will interrupt anything that you were doing when someone walkie-talkies you. So if I am wearing the watch and going to a meeting, I quickly check if the dot is ON and if so I disable the walkie talkie by toggling the ‘Available’ to OFF. I will re-enable it again when its ok for me to be interrupted. Incidentally, the walkie-talkie overrides your Do not Disturb setting.